Looks like Spain has a new King of the Sprints. Bruno Hortelano (Cornell ’14) broke the Spanish national record in the 100m not once, but twice, today at the Meeting de Madrid competition. Hortelano first broke the national record of 10.14 in the semifinals where he ran 10.08, but he turned it up in the finals where he broke it again with a 10.06 time to finish second overall in the event. The time is an Olympic qualifier and the fastest time ever run by a HepsNation athlete. 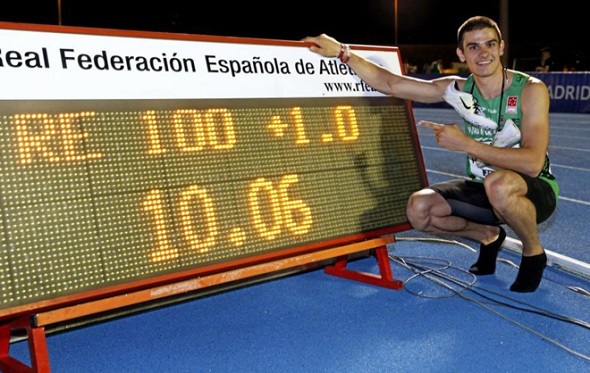 Hortelano is also the Spanish record holder in the 200m with 20.47, which he set earlier this season (we reported it here). It is also an Olympic qualifying mark. This entry was posted on Thursday, June 23rd, 2016 at 9:04 pm. It is filed under Alumni, Olympics, Spotlight. You can follow any responses to this entry through the RSS 2.0 feed.